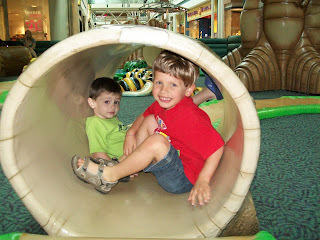 We frequently stop to play at the big tree play area in The Woodlands mall, but this was the first time that Brady played there. 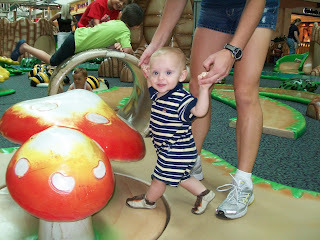 He had a great time walking and crawling around, exploring the giant flowers, mushrooms, tree trunks, and tunnels. And he loved seeing all the other kids running around playing. Dawson, as usual, had a great time running and climbing on everything. 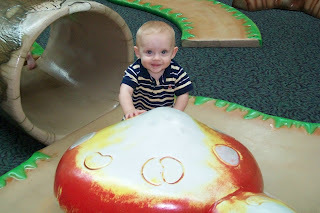 Brady by the giant mushroom. Happy to be walking around. 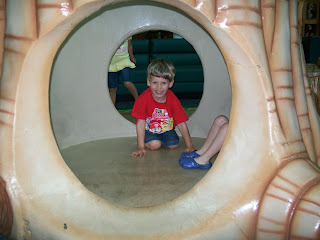 Dawson hanging out in one of the tunnels with a friend he made while there.